Medium: original etching. One of just a few night scenes composed by Claude Gellée (better known as Claude Lorain), this etching was executed in 1634. The impression offered here is printed on wove paper; this is the final state and the date of printing is unknown. The sheet measures 4 1/8 x 6 3/4 inches (105 x 173 mm). Not signed. Condition: the margins are trimmed, the etching has been mounted by a previous owner at the four corners onto a support sheet, and there are some areas of discoloration to the paper. Medium: original etching, showing a view of the Pont-Neuf and the Tour de Nesle. Catalogue reference: Lieure 668. This impression on watermarked laid paper is from the 1868 Hamerton edition. This was printed from Jacques Callot's original plate and published in London for P. G. Hamerton's "Etching and Etchers". Hamerton was an accomplished etcher himself and was a perfectionist about the quality of printing. The plate measures 6 3/8 x 13 1/4 inches (162 x 336 mm). Signed in the plate. Condition: this was published as a folded sheet (with two center folds) and there is some age-toning. 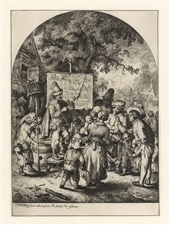 This is one of the better known Jacques Callot etchings. The COMPLETE set of 12 Jacques Callot etchings plus the title plate. Medium: original etchings. Catalogue reference: Lieure 539, etc... These are later impressions on printed cream laid paper. Plate size: 3 1/2 x 2 3/4 inches (each); 92 x 73mm. Condition: all have margins and most are in good condition; two have small tears (repaired) and some have minor skinning at the corners on verso where they had once been mounted. 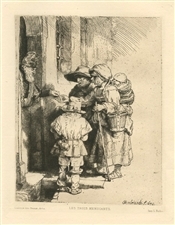 Medium: etching (after Rembrandt). This is not an original Rembrandt etching, but is a good copy (by artist unknown) etched after Rembrandt. 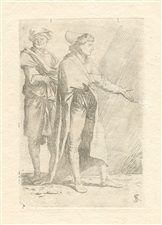 This impression on laid paper was printed in Paris by L. Eudes for the Gazette des Beaux-Arts; the image measures 6 1/2 x 5 inches (165 x 128 mm). 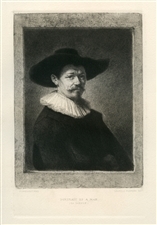 With original Rembrandt etchings bringing very high prices, faithful copies such as this have become quite collectible. Giovanni Benedetto Castiglione (il Grechetto) etching "Man wearing a plumed fur Cap and a Scarf"
Medium: etching. Catalogue reference: Bellini 52 iii/iii. This etching is one of the Three Plates from Large Studies of Heads executed by Castiglione, and this impression was printed ca. 1800-1820. Size: 7 x 5 13/16 inches (178 x 146 mm) with trimmed margins. This impression is printed on thin China paper, mounted by a previous owner onto a support sheet. In excellent condition, with no stains or foxing. Signed in the plate. Rembrandt van Rijn (after) "Portrait of a Man - Le Doreur"
Medium: etching (etched by Leopold Flameng after Rembrandt). Printed on heavy cream wove paper, from the Sylvester R. Koehler portfolio of etchings, published in 1885 by Cassell & Company. Image size: 7 1/4 x 5 1/4 inches (183 x 135 mm); plate size: 8 1/2 x 5 3/8 inches (218 x 143 mm). Not signed. 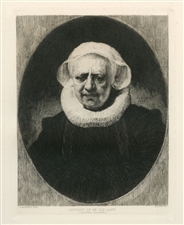 Medium: etching (etched by Paul Rajon after Rembrandt). This sale includes two different states of the same etching. Printed on heavy cream wove paper, from the Sylvester R. Koehler portfolio of etchings, published in 1885 by Cassell & Company. Plate size: 7 1/4 x 6 inches (190 x 151 mm). Not signed. The Landing on the Latium Coast Medium: etching and aquatint (after the drawing). 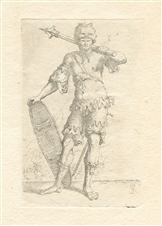 Engraved by Richard Earlom (1742-1822) after Claude le Lorrain. From Claude Lorrain's Liber Veritatis, this is Plate 122. The inscription states that this work was published in London in 1776 by John Boydell. Plate size: 8 x 10 1/4 inches (205 x 260 mm). Signed in the plate. Condition: the remains of old tape mounts can be found in the top margin (away from the plate and not affecting the etching). A strong, rich impression, printed on wove paper. 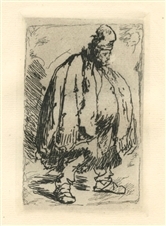 Medium: etching (after Rembrandt). This is not an original Rembrandt etching, but is a good copy (by artist unknown) etched after Rembrandt. This is a late 19th Century impression on Arches laid paper; the plate measures 3 1/2 x 3 1/8 inches (87 x 81 mm). With original Rembrandt etchings bringing very high prices, faithful copies such as this have become quite collectible. 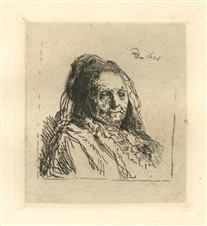 Medium: etching (after Rembrandt). This is not an original Rembrandt etching, but is a good copy (by artist unknown) etched after Rembrandt. This is a late 19th Century impression on Arches laid paper; the plate measures 4 5/8 x 3 1/4 inches (122 x 80 mm). With original Rembrandt etchings bringing very high prices, faithful copies such as this have become quite collectible. Giovanni Benedetto Castiglione (il Grechetto) etching "Head of an Oriental"
Medium: etching. Printed ca. 1800-1820. Size: 4 3/8 x 3 1/4 inches (image); 113 x 83mm with thread margins. This impression is printed on thin China paper, mounted by a previous owner onto a support sheet. Not signed. In excellent condition, with no stains or foxing. 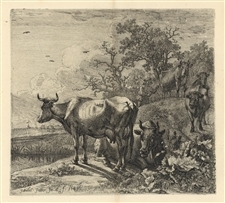 Paulus Potter original etching "The Herdsman"
Medium: original etching. This impression on laid paper was printed in London in 1868 for the rare first volume of P. G. Hamerton's "Etching and Etchers". Plate size: 7 1/8 x 8 inches. Signed in the plate. Condition: this impression was printed on a folded sheet, so there is a center crease. Jacques Beurdeley | Jacob van Ruisdael etching "Le buisson"
Medium: etching. 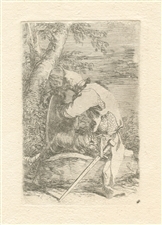 Etched by Jacques Beurdeley after Jacob van Ruisdael. Catalogue reference: Sanchez & Seydoux 1906-2. Printed in Paris and published in 1906 by Gazette des Beaux Arts. Plate size: 5 1/2 x 7 inches (140 x 175 mm) and printed on a japon-style paper. In excellent condition. Not signed. Medium: engraving and mezzotint (engraved in London during the 19th Century after the Italian Baroque painter Salvator Rosa (also known as Salvatore Rosa). A nice impression on wove paper, with delicate mezzotint tone. The plate measures 7 5/8 x 11 1/8 inches. Not signed. Condition: there are a few spots of foxing. Karel Dujardin original etching "The Shepherd behind the Tree"
Medium: original etching. This impression on laid paper was printed in London in 1868 for the rare first volume of P. G. Hamerton's "Etching and Etchers". Plate size: 5 3/8 x 7 1/4 inches (140 x 185mm). Not signed. Medium: etching. This impression on laid paper appears to have been printed ca. the late 18th or early 19th century, although the exact date of printing is unknown. The plate size is 5 3/4 x 3 3/4 inches (145 x 95 mm). Not signed. Medium: etching. This impression on laid paper appears to have been printed ca. the late 18th or early 19th century, although the exact date of printing is unknown. The plate size is 5 3/4 x 3 3/4 inches (148 x 96 mm). Signed in the plate. Medium: etching. This impression on laid paper appears to have been printed ca. the late 18th or early 19th century, although the exact date of printing is unknown. The plate size is 5 1/2 x 3 1/2 inches (140 x 90 mm). Signed in the plate. Medium: etching. This impression on laid paper appears to have been printed ca. the late 18th or early 19th century, although the exact date of printing is unknown. The plate size is 5 1/2 x 3 1/2 inches (143 x 94 mm). Signed in the plate. Medium: etching. This impression on laid paper appears to have been printed ca. the late 18th or early 19th century, although the exact date of printing is unknown. The plate size is 5 3/4 x 3 3/4 inches (145 x 96 mm). Signed in the plate. 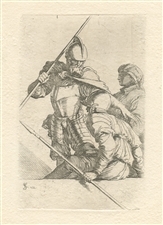 Christian Wilhelm Ernst Dietrich etching "The Mountebank"
Medium: original etching. This impression on heavy cream wove paper, from the Sylvester R. Koehler portfolio of etchings, was published in 1885 by Cassell & Company. Plate size: 10 1/4 x 7 1/2 inches (262 x 190 mm). Christian Wilhelm Ernst Dietrich was also known as Dietricy. Signed in the plate, not by hand. Condition: there is some foxing in the margin, not affecting the etched image. Medium: etching, engraving and mezzotint (after Claude Lorrain). This lovely impression on wove paper was engraved by G.H. Every for the "Beauties of Claude Lorraine" portfolio. The inscription states that this work was published in London in 1825 by W.B. Cooke. The plate size is approximately 8 1/2 x 11 1/2 inches and the sheet is 10 3/4 x 16 inches. Not signed. Condition: there is foxing and discoloration to the paper. Medium: etching, engraving and mezzotint (after Claude Lorrain). This lovely impression on wove paper was engraved by Thomas Lupton for the "Beauties of Claude Lorraine" portfolio. The inscription states that this work was published in London in 1825 by W.B. Cooke. The plate size is approximately 8 1/2 x 11 1/2 inches and the sheet is 10 3/4 x 16 inches. Not signed. Condition: there is foxing, skinning and discoloration to the paper. Medium: etching, engraving and mezzotint (after Claude Lorrain). This lovely impression on wove paper was engraved by John Bromley for the "Beauties of Claude Lorraine" portfolio. The inscription states that this work was published in London in 1825 by W.B. Cooke. The plate size is approximately 8 1/2 x 11 1/2 inches and the sheet is 10 3/4 x 16 inches. Not signed. Medium: etching, engraving and mezzotint (after Claude Lorrain). This lovely impression on wove paper was engraved by Henry Dawe for the "Beauties of Claude Lorraine" portfolio. The inscription states that this work was published in London in 1825 by W.B. Cooke. The plate size is approximately 8 1/2 x 11 1/2 inches and the sheet is 10 3/4 x 16 inches. Not signed. Medium: etching, engraving and mezzotint (after Claude Lorrain). This lovely impression on wove paper was engraved by G.H. Phillips for the "Beauties of Claude Lorraine" portfolio. The inscription states that this work was published in London in 1825 by W.B. Cooke. The plate size is approximately 8 1/2 x 11 1/2 inches and the sheet is 10 3/4 x 16 inches. Not signed. Medium: etching, engraving and mezzotint (after Claude Lorrain). This lovely impression on wove paper was engraved by Thomas Hodgeus for the "Beauties of Claude Lorraine" portfolio. The inscription states that this work was published in London in 1825 by W.B. Cooke. The plate size is approximately 8 1/2 x 11 1/2 inches and the sheet is 10 3/4 x 16 inches. Not signed. Medium: etching, engraving and mezzotint (after Claude Lorrain). This lovely impression on wove paper was engraved by W. Say for the "Beauties of Claude Lorraine" portfolio. The inscription states that this work was published in London in 1825 by W.B. Cooke. The plate size is approximately 8 1/2 x 11 1/2 inches and the sheet is 10 3/4 x 16 inches. Not signed. Medium: original etching. 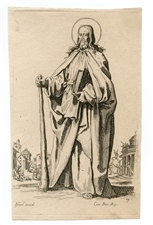 This is "St Jacques le Mineur" from the Jacques Callot "Les Grands Apotres" suite. This is a later impression on cream laid paper. The plate measures 5 7/8 x 3 3/4 inches (150 x 95 mm). Condition: thread margins and old glue residue on verso at the four corners.